Street Art Festival is not only an unusual event, which takes place between 25th and 27th of July. Parts of it are also various pre-fest activities which give opportunity to warm everybody up and taste a little bit of an atmosphere of the that are waiting for us in the last days of the month. 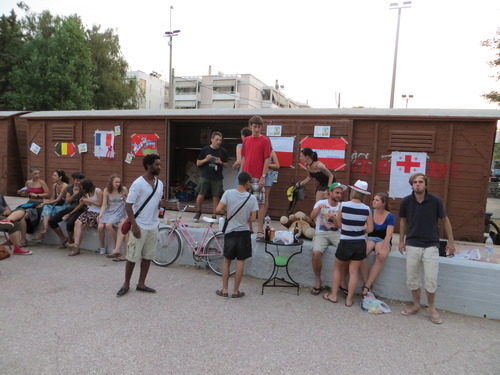 First pre-fest activity took place in the last Friday 12th of July on the square next to the Youth Centre. The target of most of us were children. We prepared a lot of activities, which gave them a chance to improve their creativity and let them feel free in composing little pieces of street art. Special corner with games offered them also face painting, so after few hours we could see colorful compositions and patterns on children (and EVS volunteers as well) faces. Very important part of the evening were special walls on which children could using different materials (sprays, various types of paints, markers, brushes, bottles of paints and even their own hands) paint what they wanted. The inspiration for them was for sure a graffiti show which gave a guest from France. Voluntaries from music workshop prepared a little concert, singing with accompaniment of guitars, uculele, mouth organ and rattles. Surprise for viewers in the square was a flash mob in which participated all short term voluntaries. Based on everybody’s own dance improvisation and song by Florence and Machine “Dog days are over” proved ballet skills of Charlotte and great spontaneously of all of us. It was just the first part of pre-fest activities, we are waiting for next! Austria, Belgium, France, Poland and Turkey - it’s not easy to present five countries during one night, nevertheless we made our best and showed the most interesting and the funniest elements of our cultures. The event started with children games. After 5 minutes I was bored with listening to “Napoleon, napoleon,…" but local children apparently enjoyed it very much and were risking their lifes just to win, to be the best, even though they couldn’t expect any prize. Then time for presentations came. But the dances were more interesting. We saw elegant Waltz, traditional Polish Polonez, crazy French Pakito and some Turkish movements. Quiz was sometimes tricky, but mainly banal. At the end we could all admire impressive fire show by Mateusz from Poland, as he cleverly manipulated flaming balls. 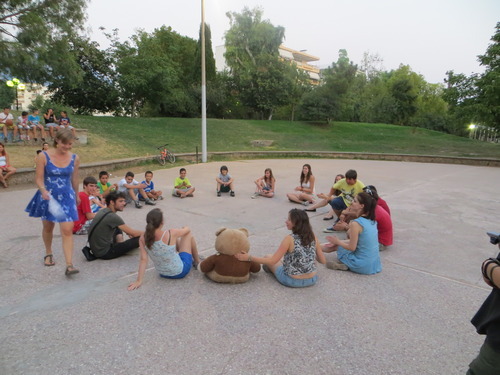 I think the volunteers enjoyed it, however it’s a pity that only few citizens of Kalamata were at the park at same time and - apart from children - they didn’t participate in our activities.